Rolls-Royce has signed a Trent XWB engine and long-term TotalCare® service agreement with China Eastern Airlines involving the airline's 20 Airbus A350-900 aircraft. The agreement, worth over CNY10 billion (over US$1.1bn), is expected to be one of the largest deals announced at the first China International Import Expo (CIIE) taking place in Shanghai from 5-10 November, 2018. It was signed at the CIIE, which was attended by hundreds of delegates from the global business community and government officials from across the world, including Liam Fox, Secretary of State for International Trade, United Kingdom, who led the British delegation at the event. China Eastern ordered 20 Airbus A350 XWB aircraft in 2016 to strengthen its widebody fleet for international routes and meet the needs of the fast-growing Chinese aviation market. Today's announcement follows a Letter of Intent (LOI) signed in 2017. Rolls-Royce Trent 700 engines already power all of China Eastern Airlines' 59 Airbus A330 aircraft in service. Tang Bing, China Eastern Airlines, Executive Vice President, said: "The new A350 XWB aircraft will help China Eastern speed up our global expansion. The partnership with Rolls-Royce for engine and service supply will allow both the parties to benefit from each other's advantages in terms of business scale, technology, development and cooperation, providing unparalleled experience to Chinese and international passengers." 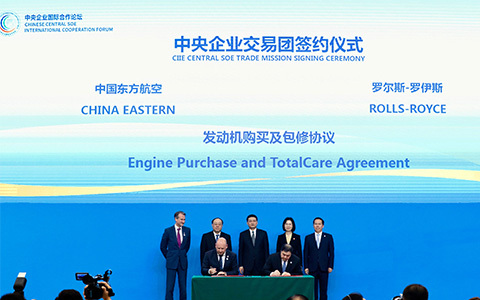 Paul Freestone, Rolls-Royce, Senior Vice President – Customers, Civil Aerospace, said: "We are proud to have signed this service agreement with China Eastern, a much-valued customer, at such a significant event. Our industry-leading TotalCare solution will ensure the optimal lifetime performance of these world-leading engines powering the excellent A350 aircraft." The Trent XWB is the world's most efficient large civil aero engine with more than 1,700 engines already sold to 46 customers. The first A350 XWB aircraft entered commercial service in 2015. The China International Import Expo (CIIE) was announced by Xi Jinping, the President of China at the Belt and Road Forum in May, 2017. Rolls-Royce intends to secure a significant amount of business with a number of Chinese companies across different sectors, representing UK manufacturing on a global scale and demonstrating the importance of international trade.